In today’s fast-paced world, we must respect volunteers’ contributions of time and talents. 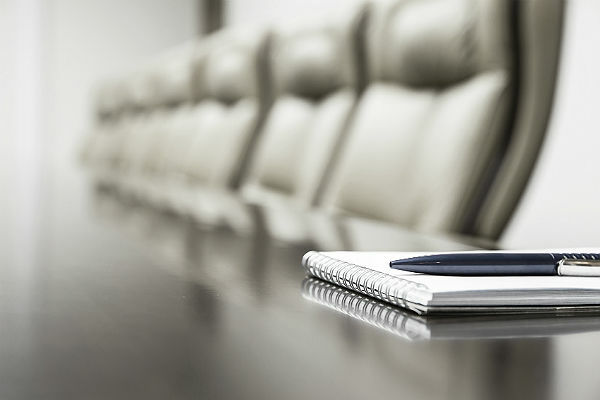 It will be difficult to convene a quorum if directors feel the meeting wastes their time. One wonders how the board gets to the essential business of mission and goals if reports consume most the time. A consent agenda may be the solution, technology may be the mechanism. Consent means permission for something to happen or agreement to do something. A consent agenda is an efficient meeting practice that groups routine reports into a single agenda item. The reports are distributed in advance with the expectation they will be read before the board meeting. At the start there may be resistance to use of a consent agenda. Some boards feel as if a committee or officer who prepared the report should have a right to have time on the agenda to present it. It requires that reports be in writing and prepared by a deadline before the meeting. They will distributed with the meeting notice and agenda. Technology integration improves the process. The consent process requires discipline. Discipline to draft and submit timely and meaningful reports. Discipline to ensure that directors read the items in advance. Also discipline to avoid bringing the reports up again during the meeting. It usually starts with someone saying, “I just have a question about that.” The question takes the conversation down a rabbit hole. 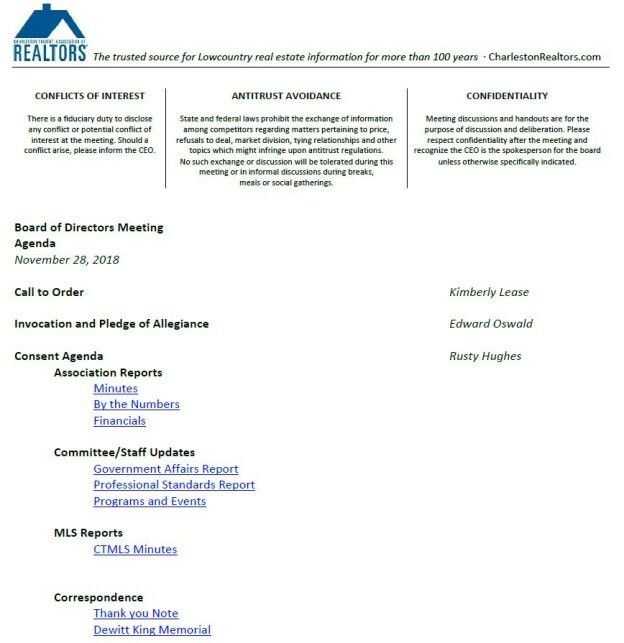 The board of directors at the Charleston Trident Association of REALTORS® adopted the consent agenda process several years ago. It has allowed for better-prepared directors, desired results and shorter meetings. Start by deciding what should go on the consent agenda. For example, the previous meeting minutes, financials and standing committee reports are bundled for advance reading. General correspondence of board interest is also included. The process is explained at the board’s annual orientation. Directors are informed they have a fiduciary duty as trustees to prepare for meetings. Each item in the consent agenda is hyperlinked to its source on a board portal or a file hosting service such as Dropbox. Directors click on a link to review the information before the meeting. The board’s regular agenda is available at the meeting with similar links. Directors using tablets can pull up reports with a single click. The board president asks if anyone wants to discuss anything in the consent agenda. If not, there is a motion to accept the items presented. If the motion gets a second, the floor is open for discussion. Once discussion is complete, the motion is voted. If anybody wants to discuss something in the consent agenda, he or she may ask for it to be removed. The president receives an amended motion to accept the items in the consent agenda with the exception of the excluded item. If the motion gets a second the floor is open for discussion. Once discussion is complete, the motion is voted. Immediately following this vote the item pulled from the consent agenda is discussed and any action warranted is taken. Another time saving tip is to link the other items in the remainder of the agenda so directors have access to information before they are discussed and voted. This process supports knowledge based board decisions. Efficient, effective meetings, and only convening as needed, has supported director participation and understanding while improving outcomes for the association and members. Postscript: CTAR includes three reminders at the top of board agendas: an antitrust avoidance statement, a conflict of interest reminder, and a notice about confidentiality. Wil Riley, CAE, IOM, is the CEO at the Charleston Trident Association of REALTORS® in South Carolina.